This book is about inter-firm cooperation, and how and why it differs from country to country. 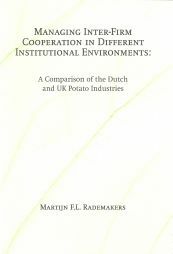 Based on a cross-national comparative study between the highly competitive Dutch and UK potato industries, the book reveals that both bilateral (i.e., firm-to-firm) and multilateral forms (i.e., business associations) of cooperation differ greatly between these countries. Moreover, it is shown that inter-firm cooperation can be considered as an important way to gain competitive advantage in internationally competitive markets. The book provides an interpretive framework for analysis, helping to explain why distinct ways of inter-firm organization can develop in same industries, in different countries. It is argued that managers need to take into account the influence of key social institutions when they develop their strategies, and that they, to some degree, can influence them for the benefit of their organizations.